The latest release, January 9, 2010, of this excellent free application, prompts the following re-post. 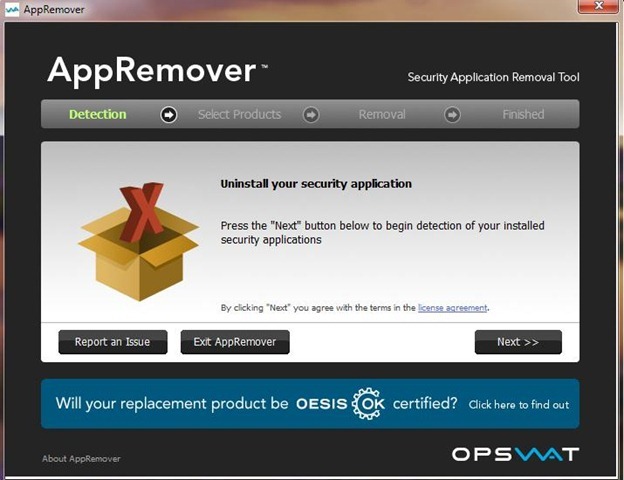 If you’ve ever struggled with trying to delete an existing security application, before installing a substitute security application, you will find AppRemover invaluable. Earlier this year, a question from a regular reader of this site, started me thinking about the issues faced by typical computer users when they need to, or want to, remove existing security applications which they are replacing with a product perhaps more suited to their needs. In some cases, removing the application through the Windows Add/Remove applet is a sheer waste of time. Worse, some security application’s own uninstaller will not adequately remove various and sundry registry entries, coupled with hidden files, making it all but impossible to install the user’s new application of choice – due to conflicts with these same registry entries and hidden files. For example, I recently installed Norton 360 for testing purposes. After the test period, I had extreme difficulty in removing this program, despite the fact I had used my favorite freeware uninstaller utility, Revo Uninstaller. Now, I’m not picking on Norton, they offer outstanding products; but, I’ve certainly dealt with applications that are far easier to remove. While it’s true that selective companies do offer a unique uninstaller to remove their applications, including Norton, in my view, there has to be a better way; and there is. 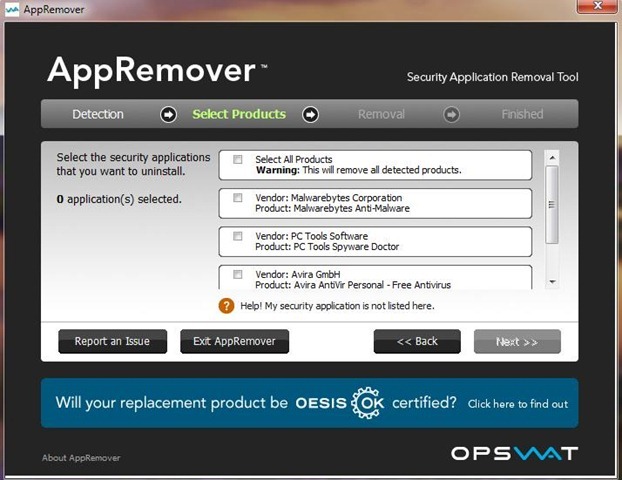 AppRemover a powerful free anti-malware, antivirus application remover which supports the removal of virtually all of the most popular antivirus and antispyware applications. Since the application is a stand-alone application, running from a USB drive is a breeze. The interface couldn’t be any easier to understand; as the following graphics illustrate. This is a great little tool, and I’ve added it to my “emergency tool kit”, on a USB drive. If you are tech inclined, and even if you’re not, I recommend that you do too. Note: AppRemover is free for personal, non-commercial, use only. 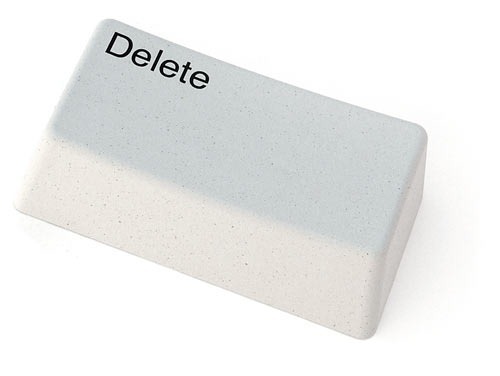 Yes, using this free tool can save a user from some real difficulties in deleting security applications. As you know, some security apps are virtually impossible to delete. I do have a Twitter account, but I don’t often have time to post to Twitter. I know I should make the time, since Twittering can be very advantageous, but………. I notice that you have become a “regular” reader, and I thank you for that – it’s very encouraging. Great find, I’ll definitely check this one out. I’m also a regular reader or your blog (although I didn’t comment). I really learned a lot especially in security. I used Zsoft Uninstaller in very thing I installed in my machine. But it is true, Its really hard to uninstall security programs. Thanks for this app sir Bill. I will try this one. Thanks for dropping by Vhick, and for the heads up on Zsoft Uninstaller. From what I can see though, development stopped at the Win XP version. Yup! your right. Zsoft is really good. Atleast for XP. Another one I try is Total Uninstall and its really really good. But not free. No one can compare in free version. Thanks for the info on Total Uninstall – not free (as you pointed out), but it does have a generous 30 day trial period. I particularly like the process of the app monitoring system changes during the installation of a new program. The very best way for an uninstall app to deal with issues, in my view. Once I use this apps to remove an antivirus named Quick Heal and this tool really help me to completely remove that security utility. This tool is a must have app for all PC user. However, I’m now happy with Windows 7 app removing feature. Yet not face any problem. Windows applets do the job nicely for most average users, but super users often find these applets just a little weak. Nice software.. But i think its a bit advanced for newbies… Anyway, I’ll download it and keep it as a emergency kit like you to uninstall any security tool in case of any error..
BTW, revo failed to uninstall Norton.. huh… What about the pro version Bill…? I haven’t tried Revo Uninstaller Pro, but I suspect I may have faced the same problem. Norton writes itself into so many areas of the OS, the user has no choice but to use Norton’s uninstaller. This is a great app… I use it all of the time! Sometimes you have to use a crowbar to get that last stubborn brick out, and this application is my “brick remover” for deleting security apps. Couldn’t live without it. Hi bill iam using RevoUninstaller and its working great so should ireplace it with appremover? No, Ahmed – do not replace Revo. As you know, this is a multi-purpose uninstaller which removes most, if not all, of an unwanted applications registry entries. AppRemover, on the other hand, is a single purpose uninstaller designed specifically to remove unwanted “security applications”. Thank you bill as you know iam only using spyware docor +AntiVirus and pctools firewall plus so do ineed appremover for them or just Revo will do? Inever use Norton 360 (idont even know what its for) LOL . This is one of a kind tools to have – got my hands on it about a year or so. Now, I can’t imagine computing life without it. Unfortunately for me, I experienced the case of “When competing security applications tie up your computer”. This gem did a great job in Win Safe Mode, giving me back control of my system. One of its great features is the “Clean Up a Failed Uninstall”. RevoUninstaller Pro has a few more features than the free version. One is “Forced Uninstall”, which might do the trick for Norton. Can’t vouch though, as I only use AppRemover for security applications. You can’t replace RevoUninstaller with AppRemover, even if you want to, as the later detects only security applications, meaning you can’t use it to uninstall any other program. Just used the “Clean Up a Failed Uninstall” mode last night – invaluable.